Haatchi, an Anatolian shepherd, was just five months old when he lost his leg. When his owners decided they no longer wanted him, they opted not to take Haatchi to a local animal shelter; instead, they hit him over the head and left him for dead on North London railroad tracks. Haatchi was crushed by a train but survived, his tail and one of his legs critically injured; both had to be almost entirely removed after the dog managed to crawl to safety. Just six weeks later, the dog's caretakers were more successful than they could've imagined: they didn't just find Haatchi a home -- they found him a best friend and a family. Haatchi was adopted by the Howkins family, whose seven-year-old son, Owen, suffers from a rare genetic disorder called Schwartz Jampel syndrome. The disorder forces his muscles into a permanent state of tension. 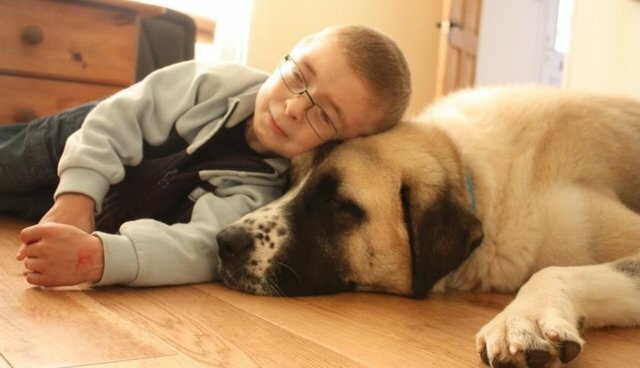 Before Owen met Haatchi, he never wanted to leave the house, afraid of how people would see him because of his disease. But, as one UK filmmaker chronicles in a recent documentary about the Howkins family, Haatchi has changed everything for his young owner. According to Owen's parents the boy has developed a confidence and excitement about life that he never had before: he enjoys going outside and interacting with strangers, and even participated in the UK's largest dog show in 2013 -- and it's all because of Haatchi. "What I've taken from the relationship between Owen and Haatchi is that no matter how bad things get, there is always something good in the world," Owen's mother said. "Owen and Haatchi signify what you think when you think of pure love."